Our child’s spine is literally the backbone for the overall health of their young bodies. Many parents have not been made aware of the necessity to schedule regular and periodic spinal check-ups. Many people know that chiropractic is beneficial for adults, but did you know that children—even infants —can benefit as well? Today more parents than ever before are bringing their children to Doctors of Chiropractic for common health concerns and to support a healthy lifestyle. According to the Journal of Pediatrics, chiropractic is the most sought after form of holistic healthcare for Americans. Children are highly susceptible to trauma in their spines. Since spines grow rapidly during the first five years of life, checking for abnormalities during this time is critical for proper development. Though symptoms may not surface until years later, injury to vital nerves can result in a lifetime of serious health problems. Chiropractic is especially necessary for young athletes in contact sports or informal recreation. However, parents bring their children to chiropractors for everyday health concerns. Why do children go to the chiropractor? These top 10 conditions account for almost 70% of the reasons why children make visits to the chiropractor. There are also many, many other reasons why children visit the chiropractor. Chiropractic is absolutely safe for children. Chiropractors have been adjusting children for more than 100 years without any incident which has harmed even one child. Surveys of malpractice insurers revealed not one claim filed against a chiropractor in the past twenty years for harming a child with a spinal adjustment. This is a record that the chiropractic profession is very proud of and one that should give parents comfort in making the decision to choose chiropractic care. Doctors of Chiropractic use very gentle and specific techniques for children. Chiropractic adjustments release the body’s healing powers in children just like in adults. 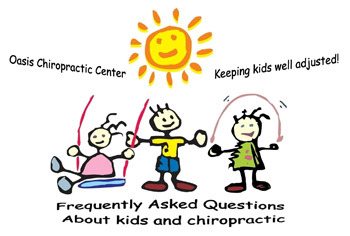 When should children go to a chiropractor? Children should be checked right after birth because of the potential damaging effects of the birth process. Even the most natural births are somewhat traumatic to the infant and may have “hidden damage.” Studies show that many children who experience symptoms of colic, ear infections and asthma have spinal subluxations impairing their nervous system function. Early detection and correction can prevent layers of damage from occurring in the child’s vital nervous system. Accumulated damage can have lifelong consequences. What childhood conditions can be caused by subluxations? Many people think of chiropractors as low back pain doctors. Surprisingly, low back pain is not a common reason that children visit the chiropractor. The most common conditions for which children visit the chiropractor have little to do with spinal pain. Most childhood problems treated by chiropractors are common conditions which appear to have nothing to do with the spine. ear infections, fever, croup, colic, bed wetting, torticollis, poor posture, constipation, weakness or fatigue, loss of hearing, arthritis, irritability, neck aches, sore throat, cough, skin disorders, bronchitis, poor coordination, extremity pain (shoulders, arms, hands, hips, knees, feet), hypertension, nervousness, stomachaches, numbness, headaches, backaches, eye problems, sinus problems and allergies, asthma, frequent colds, poor concentration, painful joints, scoliosis, hyperactivity, nursing/feeding difficulties, disturbed sleeping patterns, restricted head motion, “growing pains”. How can the spine being out of alignment cause a child to get sick? The normal functions or physiology of the body are all controlled by the nervous system. When the bones of the spine (i.e., vertebra) are out of alignment, this can cause interference with the nervous system which can affect the way the body functions. For example, tight muscles in the neck—caused by malfunctioning spinal nerves—can block the flow of fluid from the middle ear, resulting in persistent earaches and/or ear infections. How can parents know if a child needs chiropractic care? Unless a child has an obvious symptom, it can be difficult for parents to recognize when a child has spinal subluxations. It is not always easy for someone other than a chiropractor, highly trained in evaluating the spine, to determine if the child has a problem; just as it is difficult for someone other than a dentist to determine if a child has any developing cavities. Both cases take the skills of a trained specialist to perform a thorough evaluation. The baby’s head consistently being tilted to one side. Restricted head or neck motion to one side. Disturbed sleeping patterns where an infant sleeps for only an hour or two at a time. Feeding difficulties in the very young infant. Difficulty nursing at the breast, especially on one particular side. What will my child’s chiropractic treatment be like? After your chiropractor finishes a thorough history and evaluation of your child’s spine to identify any areas of Subluxation, he or she will then deliver a gentle but effective chiropractic adjustment. When treating an infant or young child, chiropractic adjustments are safe, gentle, and natural. Your chiropractor will use light adjustments with either their finger tips or a gentle tool to deliver a specific adjustment with gentle pressure to the area of Subluxation, restoring normal spinal alignment and function. With babies and infants the amount of pressure used is similar to the amount of pressure you would use to check if a tomato is ripe. No force excessive of this is ever needed nor used. A child typically needs only a few adjustments to restore the normal spinal structure since the young spine is easily adjusted into place. Kids love getting adjusted at Oasis Chiropractic Center where we have a fun and nurturing environment. Today’s parents make sure they are well-informed when making healthcare choices for their children. With the rising concern about the side effects of drugs on their children, parents are hesitant to jump to medications to merely disguise symptoms. With the overuse of antibiotics and other medications some parents are seeking other options like acupuncture, chiropractic care, craniosacral therapy and homeopathy to keep their kids flourishing. They seek out natural healthcare solutions which support their children’s natural ability to be heal. Chiropractic is a critical part of your family’s wellness lifestyle. Most of our kid patient’s see Dr. Starkman as a preventative measure to keep their bodies aligned and healthy which as a result equals to less sick days and a stronger immune system. Our children deserve to have the best possible chance at a healthy life without the use of dangerous drugs and chemicals. Do all you can to ensure your child has the best possible start to a lifetime of health and vitality and schedule your child’s chiropractic check-up today. To learn more about children and chiropractic visit the International Chiropractic Pediatric Association website at ICPA4KIDS.ORG.